After the decision to add another layer on the wall for vines, the need for strong wall supports entered the picture. These supports need to be either screwed or nailed into the concrete block wall. Honestly, I couldn't think of any other attachment (glued brackets?) that will be strong enough to support vines especially in their maturity. So what to use for attachments? Wood blocks? Plastic supports? Metal bars? Whatever it may be, the frugal gardener in me tells me (hopefully) not to spend a cent. So let's get the brain cells working! Wood blocks can deteriorate in several years and have the inherent risk of termite infestation. Plastic isn't strong enough. One-eight inch metal angle bars may be an overkill. Finally, an idea - metal brackets used for shelving. These are lightweight contraptions designed to carry load. Anchor them into the wall by nail or screw and string them together with some wires. 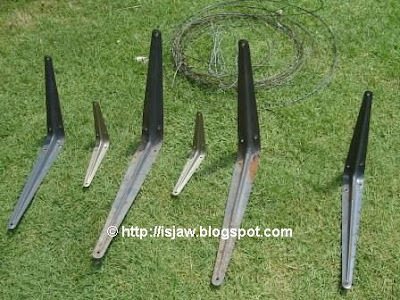 I have some old rusty brackets shown below in varying sizes and some wires. The wires are leftovers from previous projects but I don't think they're thick or sturdy enough for this project. I know I have 7 brackets, so one (small) 's missing in the picture above. The small size brackets I have are 4 inches by 5 inches. DH said that 4 inches is enough to support the vine. Hopefully, this will also "force" us to trim the vines when it gets too thick since 4 inches isn't much space to support many vine branches. Are these 7 brackets enough to cover the 16 feet width of the wall? An easy estimate is to layout the brackets along the wall as shown below. Here's another view from the other end. The nice thing about this exercise is that it allows you to visualize the brackets already attached to the wall; imagine the amount of load they're suppose to carry as well as determine the adequate spacing between them. And then you can decide if you need to buy more brackets - which are cheap, by the way. The spacing between the brackets above is roughly 4 feet. Don't forget to mark the placement of the brackets on the wall with chalk just so you don't forget where they should go. Again, the frugal gardener in me tells me I have enough brackets. And since I'll be buying wire anyway, I'll compensate by getting a slightly bigger gauge to ensure the wires don't sag much. Here's the wire that I bought - gauge 14. It isn't the biggest gauge, but it'll have to do coz it's the thickest I could get from the hardware store. Alright, time to start the work in Part 2 of this three-part series.